A crater made by an Israeli missile in front of a Popular Front for the Liberation of Palestine base on Friday. (CNN) -- The Israeli air force conducted a strike in Lebanon between Beirut and Sidon on Friday, a day after rockets struck northern Israel, the Israeli Defense Forces said Friday. There were no casualties in the Israeli strike, which stirred memories of the 2006 war between Israel and Hezbollah, the Lebanese Shiite militant group. The IDF described the launch of rockets targeting Israel as a "terrorist aggression originating from Lebanese territory." Lebanon's National News Agency said the Israeli strike occurred at dawn Friday in al-Naama, about 15 kilometers (10 miles) south of Beirut. Cross-border fire has been rare since the Israel-Hezbollah war. 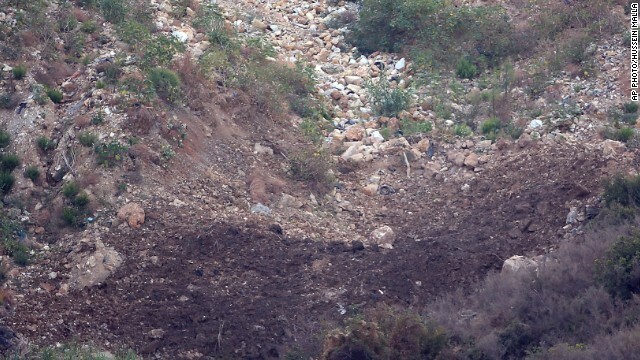 The IDF believes that global jihadist elements were behind the rocket fire on Thursday into Israel, which was launched from a village south of the Lebanese city of Tyre, IDF spokesman Eytan Buchman said. The strike hit a site belonging to the Popular Front for the Liberation of Palestine-General Command, according to Lebanon's National News Agency. The group has long been a pro-Syrian government movement. The cross-border fire comes amid anxiety in Lebanon over the Syrian civil war. A bombing near a mosque killed at least 13 people in the northern Lebanese city of Tripoli, where there has been sectarian division over Syria. Popular Front official Abu Imad Ramez Mustafa confirmed the Israeli raid, adding that "the raid targeted the valley and did not target PFLP sites." "Israel has always sought strife," he was quoted as saying by the Lebanese news agency. The Popular Front General Command maintains facilities in the area, and the National News Agency said a network of tunnels belonging to the group was hit. The Israeli attack comes in response to an attack Thursday in which four rockets were fired from southern Lebanon at northern Israel, with two of them landing in populated areas, the Israel Defense Forces said. It wasn't immediately clear where the two rockets landed. They caused property damage, but no one was hurt, the Israeli military said. One rocket was intercepted by Israel's missile defense system between the northern Israeli cities of Nahariya and Acre, the IDF said. Information on the fourth rocket wasn't immediately available. Earlier, the military said that all the rockets besides the intercepted one fell outside Israeli territory. Israeli Prime Minister Benjamin Netanyahu promised his nation would respond. The attack prompted a halt to all civilian aerial activity in northern Israel, the IDF's Buchman said.